Sheepskin coats for men are not only incredibly stylish, but also provide comfort and warmth through the colder winter months. 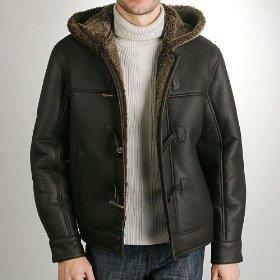 Shearling: Shearling tends to be heavier, larger and thicker wool that is then shorn to a uniform length. Slink: With a slink hide, you can expect a material that is softer and suppler than a shearling hide. Note too that slink hide tends to be naturally short and curly; this hide doesn't need to be shorn, but it is sometimes ironed "straight" to give a greater fur-like appearance. Finally, keep in mind that no matter the style you choose (whether slink or sheepskin) both materials will keep you incredibly warm and well prepared for the winter months. Men's Bostonian Shearling Coat: Available in Back Forrest, a deep green, this coat features an antique brass zip front and a four button storm-flap for added protection against the elements. Men's Hooded Shearling B-3 Bomber Jacket: If you love shearling, but are not fond of long coats, then turn your eye towards this attractive B-3 bomber style jacket. This jacket is modeled after the original World War II shearling jackets that the American fighters actually used to stay warm. The coat itself features two deep, "warmer" pockets, a removable zip hood, and adjustable side straps. You can expect to pay $449.00 for this style. Men's Shearling Car Coat: Done in a rich, warm, buttery brown, this Car coat features a smooth, supple exterior with a plush and warm interior., With its zip up front, deep warm pockets and collar that zips all the way up to the neck, you'll have no problem staying warm and looking stylish! This coat is priced at $495.00. Sickafus Sheepskins has an incredible selection of men's cots. Moreover, not only is there a wide selection, but there are also numerous photographs of their merchandise. These photos are shot in a variety of angles and environments so that the customer can get a true feel for how these coats will look and feel. Additionally, if you are thinking about purchasing a shearling coat, it's important to understand that these coats are very expensive. While "expensive" is a relative term, note that it's not at all unusual pay over $2000.00 for one of these styles. This is helpful to consider before you shop because otherwise, you may run into some sticker shock!. Keep in mind too that the even the most inexpensive of shearling coats costs about $470.00, so try to plan your budget accordingly. Sheepskin coats for men are a wonderful purchase to make because this particular style of coat is both incredibly warm and functional. Additionally, there are plenty of online shopping sites you can visit, so comparison shopping shouldn't be an issue. No matter the style you choose always take your time and understand your personal budget. This will ensure you being happy with your eventual purchase!